Tesla CEO Elon Musk said on an earnings call on Wednesday that the company is planning a “super charger” station somewhere between Los Angeles and San Francisco that can add 150 miles of charge to Tesla cars in 30 minutes. It looks like an advanced alien artifact landed in the desert, joked Musk, who said that Tesla plans to talk more about the station in early 2012, and it will use fast 90 kW chargers. 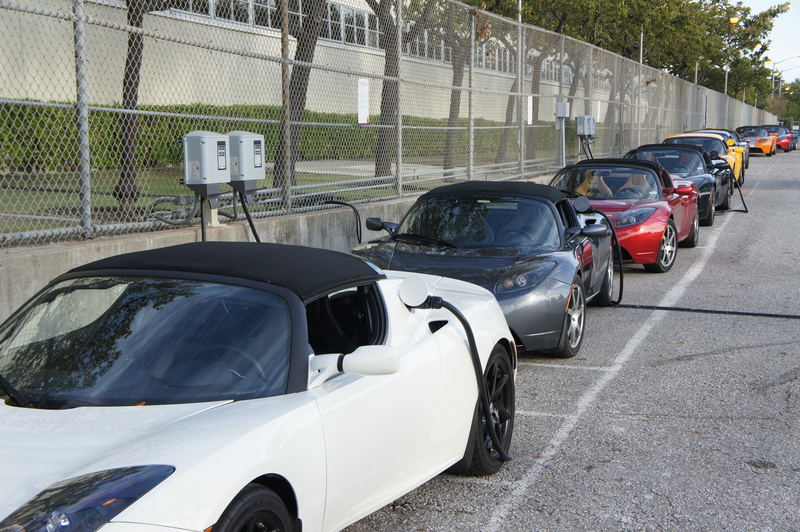 In the early days of electric vehicles, the public infrastructure for charging will be a big barrier for drivers. We drove the all-electric Mitsubishi i MiEV for a full day last week and found it hard to find public chargers (and we are in the early adopter market of San Francisco). Most early EV-owners will charge at their homes overnight, but without charging stations in public places like shopping centers, or at offices, EV drivers will be restricted to how long and where they can drive. Tesla is very interested in doing what it can to grow the overall electric vehicle market. The survival — or mainstream acceptance — of electric cars will ultimately affect Tesla’s future greatly. So Tesla investing time and money into electric vehicle infrastructure helps both the whole industry and the company’s own future. The alternative to fast charging stations is battery swapping stations, which can take out a used battery and pop in a fully charged battery. Tesla has said the Model S will have a swappable battery just in case battery-swapping becomes popular. The startup leading the charge on battery swapping for electric vehicles is Better Place, which has a business model to build battery swapping and charging stations in regions or countries and then sell electric miles driven as a service, with low cost and subsidized electric cars. It’s still early days for electric cars, so who knows what technology will ultimately dominate in various geographies. My girlfriend and I met a few months ago at a charging station; talk about a green rendezvous! In April we’re expecting our baby Electron. Elon, let me know when you want my Model X deposit.